Many athletes, parents and health- and environment-conscience people are seeking alternatives to plastic disposable and plastic reusable water bottles. 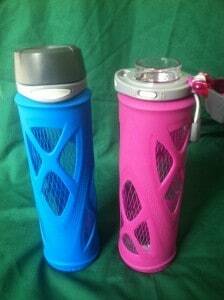 A few years ago, the trend was to use stainless steel water bottles and mini coolers for toting water and beverages. Now, there are other choices on the market constructed of glass with plastic lids and silicone protective covers. Even better, companies are now making them with recycled glass. Two of the bigger names who offer recycled glass water bottle products are EcoVessel Surf and Zulu Athletics. Read why glass water bottles are our preferred alternative. EcoVessel, based in Boulder, Colorado, offers this bottle. It is made from an estimated 60% recycled glass. Their products as safe, sturdy and made of sustainable materials. The bottles do not contain BPA or phthalate, and the composition materials are non-leaching. The Surf glass water bottle carries 22 ounces of liquid, weighs 1.3 pounds and has dimensions of 11” tall and a 3” diameter. 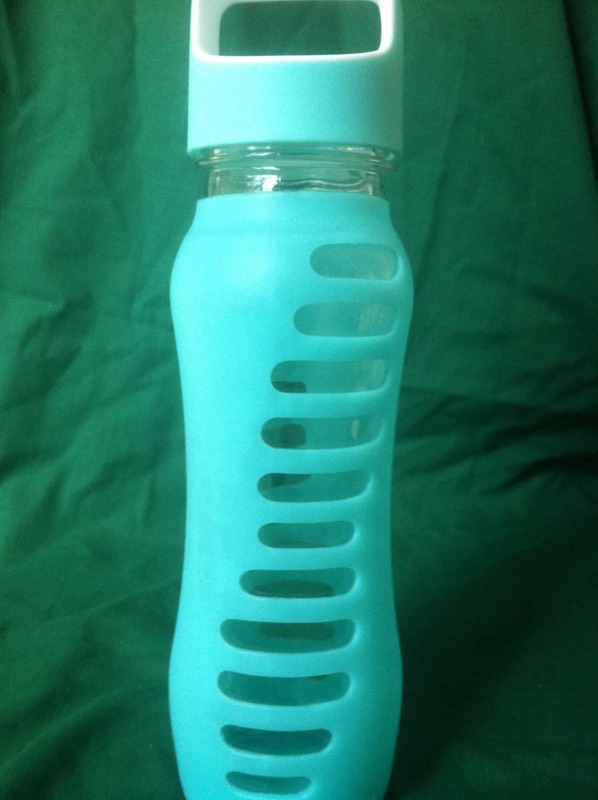 The bottle’s silicone sleeve comes in five colors: pink, orange, turquoise, gray and black. The sleeve safely protects the bottle and does not need to be removed for cleaning. The wide-mouth opening has a color-coordinated loop-top screw top. 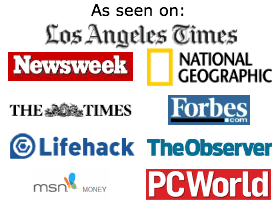 For the best selection, shoppers can purchase this product on Amazon. I have put this water bottle in the dishwasher and after months of use, the silicone sleeve is still intact. I dropped it once and was thrilled it didn’t break. The silicone sleeve covers the bottom of the bottle completely. It’s great that EcoVessel is committed to giving back. 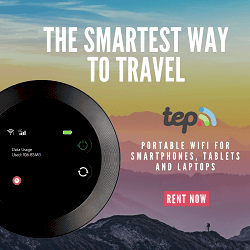 They are partnered with 1% for the Planet and give 1% of every purchase to Water for People. Water for People is an organization who works to provide safe drinking water in developing countries. EcoVessel also supports the UNICEF Tap Project. In the United States, we almost take clean water for granted. UNICEF works to improve access to safe water in less fortunate areas in more than 100 countries. They provide water treatment products and water kits, among other things, including improving sanitation facilities. After using the EcoVessel Surf Recycled Glass Water Bottle, I found there are a lot of advantages to using a plastic water bottle and stainless steel water bottle. Drinking from the glass bottle helps to preserve the clean taste of water better than stainless and plastic. It is made of safe materials and of recycled glass. Large capacity, carrying 22 ounces. 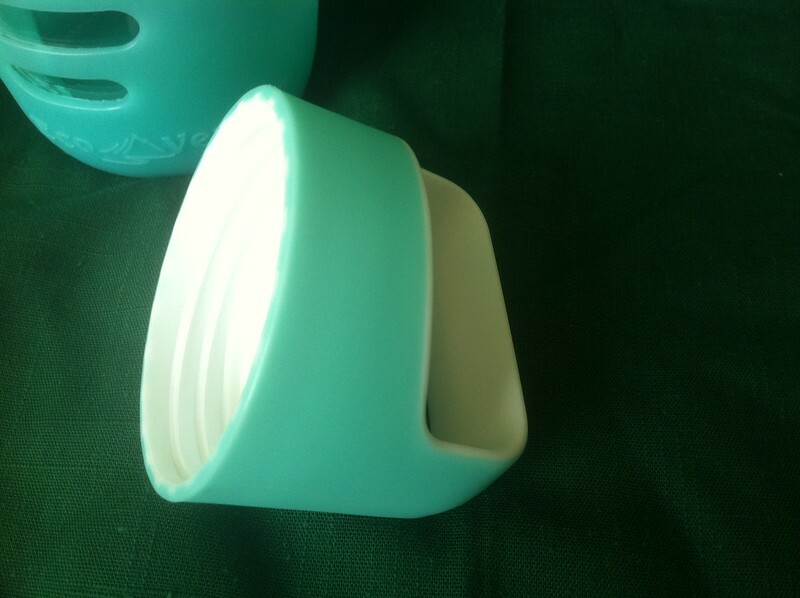 It is durable with its silicone sleeve covering the sides and the entire bottom of the bottle. Easy to grip with its ergonomically-friendly design. It is also easy to carry with the opening in the lid. Large mouth opening makes it easy to put ice in it. Easy to seal, leak-proof cap. It is easily cleaned in the dishwasher. Zulu Athletics in Chicago, Illinois markets 20-ounce bottles. Its products are made from recycled, soda lime glass and its other components are certified PBA, phthalates, PVC and lead free. The water bottles are dishwasher safe. Zulu recycled glass bottle is offered with protective silicone sleeves in gray, purple, blue, teal, pink and green. There is a choice of three types of lids. The weight, dimensions and price of the bottle are dependent on the type of lid selected. Carry-Loop: With a screw top lid, this bottle weighs 1.3 pounds with dimensions of 13”Hx3”Wx3.5”D. One-Touch: This lid (shown above) features a button to pop open the lid, a slide lock, and a soft carry loop. This is a convenient bottle to use while driving or walking. You can take hold of the bottle, press the button to open with your thumb, and easily take a drink, all using just one hand. Quick-Cap: This is designed for rapid liquid intake with side squeeze buttons. These bottles are ideal for athletes. Make a positive step toward reducing unnecessary waste in our landfills and decide now to stop buying disposable, plastic water bottles. Making a positive, earth-friendly choice by switching to glass will also help your health and your families’ health. Whether you choose the Eco Vessel Surf glass water bottle or one from Zulu, most will agree that it is great to have affordable selections that are good for our bodies and our earth. Recycled glass bottles in attractive, colorful, protective sleeves are a true example of sustainability. 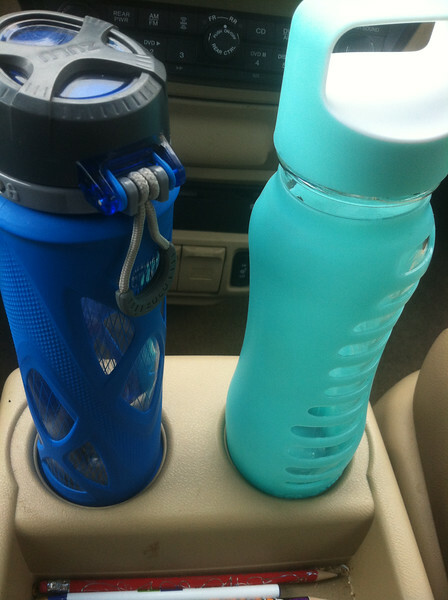 We absolutely love glass water bottles and and drinking from reusable water bottles. These are a score on both counts. When they are made from recycled glass like these are, it doesn’t get any better for us. Well, it would if they were made in America, but we have yet to find a reusable water bottle made in the USA. 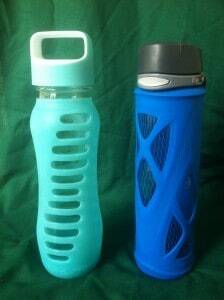 Depending on the user and the situation, we often prefer glass water bottles over stainless steel water bottles too. For my purposes, I like the flip cap on the Zulu bottle and find myself using it more often; it is my go-to bottle. It is easier for me to carry and use in general. I can easily drink it in the car with the flip cap as I don’t need two hands to open it. I also like that the opening is a little bit smaller than the Eco Vessel one so I can drink from it easier. I tend to bring the EcoVessel recycled glass water bottle when I am putting it in a bag with electronics as there is zero chance of it leaking. The Zulu bottle’s locking feature is great and also leak-proof, but I always check to ensure it is sealed before putting with my smartphone, etc. 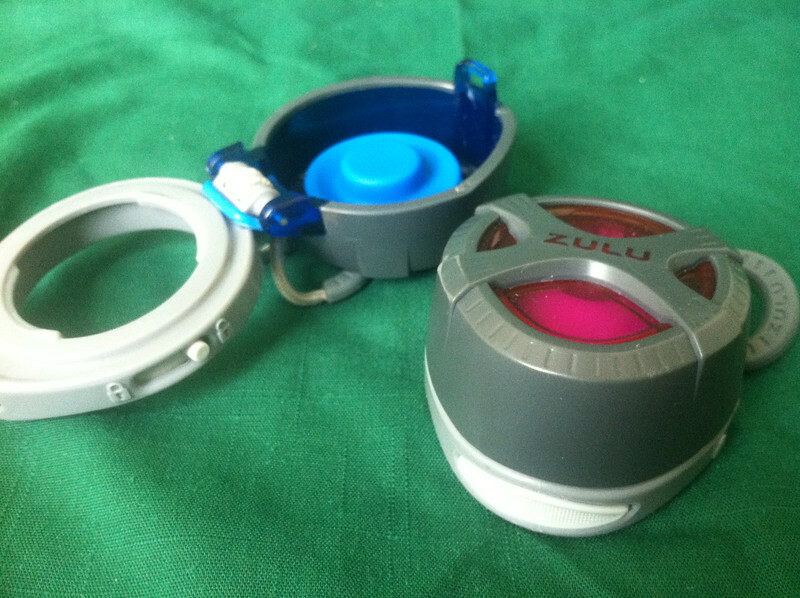 I also use the loop carrier on the Zulu bottle to carry it and like this feature. Whether you choose the EcoVessel Surf glass water bottle or one from Zulu, most will agree that it is great to have affordable selections that are good for our bodies and our earth.